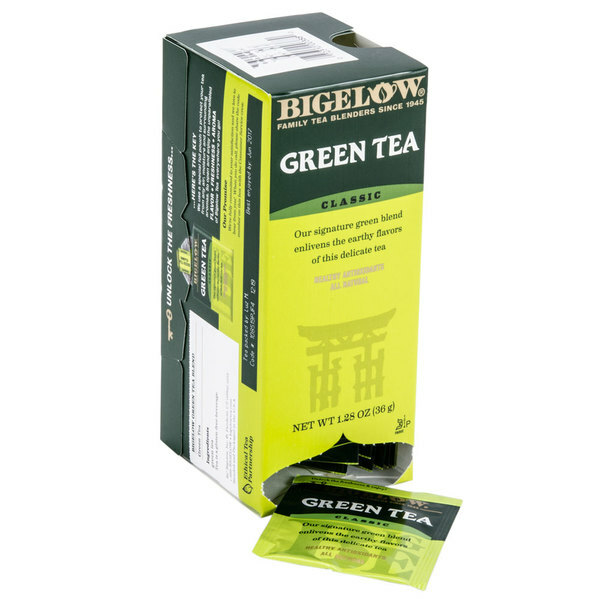 Enjoy the revitalizing effects of green tea in its purest form when you serve this Bigelow green tea! 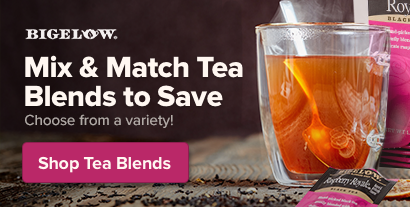 This smooth, all-natural green tea comes from the leaves of the Camellia sinensis plant and undergoes a special handling process, leaving the green tea blend more delicate and lower in caffeine than black tea. Green tea is full of antioxidants that are a great part of any healthy lifestyle. When brewed, it has a light color with a subtle green hue, refreshing flavor, and a subtle, earthy aroma. A family-owned business since 1945, and now a leader in the specialty tea industry, Bigelow prepares each tea blend with utmost care and attention to ensure the best possible tasting tea. 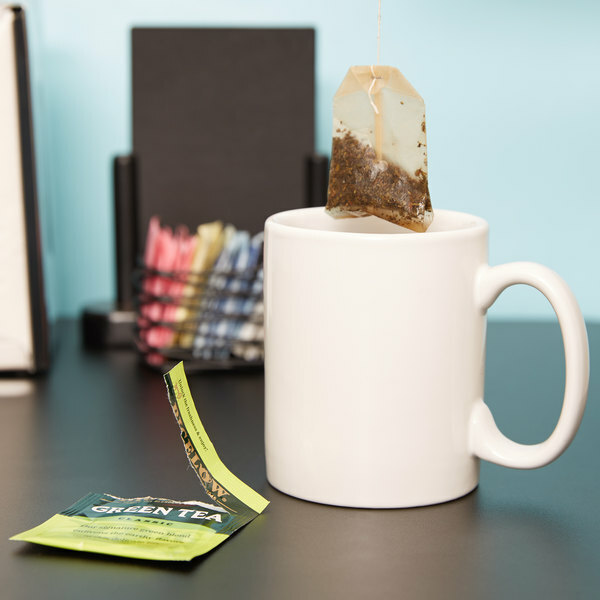 Committed to maintaining freshness and flavor, each Bigelow tea bag is overwrapped and sealed in a stay-fresh foil packet to protect the tea from air and moisture. As opposed to bulk tea, these tea packets also cut down preparation time and can be served as-is at the table. Any time is a good time to treat patrons of your restaurant, hotel, or coffee shop to a steaming cup of Bigelow tea! Bring fresh cold water to a boil. Pour water over tea bag, and steep for about 3 minutes. Remove tea bag. For iced tea, steep a little longer and pour over ice. I've been drinking this brand of tea for a few years now since I was exposed to it at work. It tastes great when you're feeling like green tea but what I absolutely love to use this is for baking. This is my go to tea for making green tea macarons. The tea goes into the macaron shells as well as into the white chocolate green tea ganache filling. The green tea macarons that I make at home are my favorite tasting flavor and using this tea it ends up tasting like green tea frappucino. The perfect green tea flavor, not too powerful but not too weak either. I personally add honey and lemon juice along with a slice. Perfect! I love Bigelow teas! The green teas in particular are my favorite. Not only do they have a bunch of different tea varieties, they also have a bunch of different green tea varieties. My current favorite is a green tea with ginseng and white tea in it; it's nice and refreshing. Great tasting tea! Bigelow is a very reputable name which customers love and appreciate. The green tea is one of the most popular flavors at my restaurant. I'm a fan of organic tea, hence the three stars. Organic tea doesn't have any less fluoride but I appreciate the lack of inorganic pesticides. As far as commercial bagged teas this is pretty much your standard tea. The tea it produces isn't actually green but this is the norm for your big store commercial bagged variety. I'd still purchase again if I found a good deal. GREAT PRICE AND GREAT PRODUCT! THANK YOU WEBSTAURANT! FAST SHIPPING AND ALWAYS ON TIME. SERVICE. CUSTOMER SERVICE IS VERY HELPFUL IF YOU DON'T KNOW THE PRODUCT. 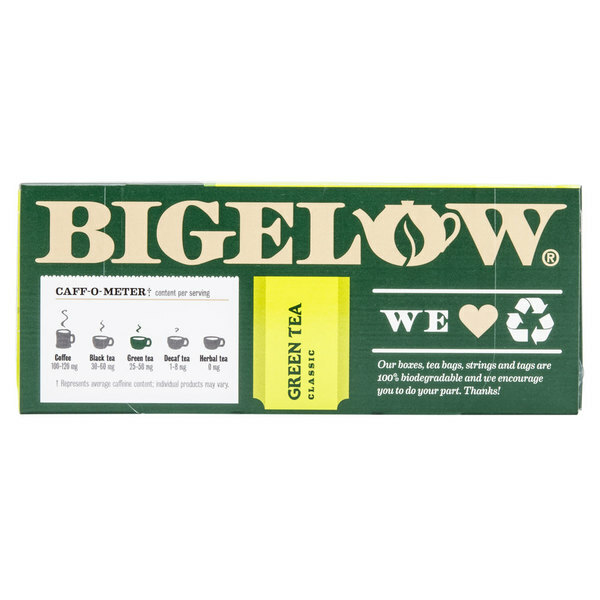 Bigelow green tea is amazing! It is the same quality tea you would buy from the grocery store and it is cheaper on here. I would definitely recommend. A nice basic green tea brand with a top notch flavor. 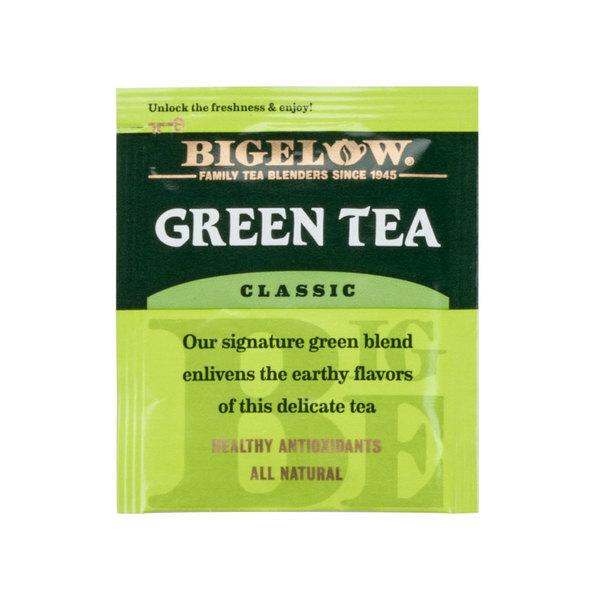 The Bigelow green tea brews up excellently and is a great tea to pair with fresh fruit. This is a great tasting and very affordable green tea made by Bigelow. It is a classic, recognizable brand for your customers. Can be dispensed right from the box and the bags are individually wrapped. A nice natural flavoring. My customers love green tea and rant and rave about this one. I love the Bigelow brand and it does not disappoint. Quality isn't as amazing as the best green teas out there, but for the price these are pretty amazing and still very tasty! can't go wrong. Bigelow is a wonderful tea brand. Excellent rich strong tea quality bags. My customers love it. Highly profitable item. I highly recommend this for any restaurant or shop. Starting ordering this tea and I can't keep it in the house. I put it out in our break room a week after we received it and it was gone in a week. You can have the expected good result from your green tea if you follow the instructions mentioned on the box. You can use for both hot and iced. This is a nice green tea that comes in individual bags and isn't terribly expensive. The individual foilized bags look good, and Bigelow is a trusted name, so they can be given to guests to steep their own tea, and will give a good impression in most instances. Wanted to add a green tea option to our menu and these worked perfect. 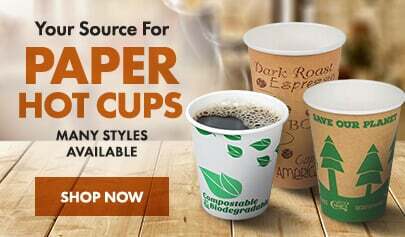 You can quickly make a single cup so your not wasting any at the end of the day. 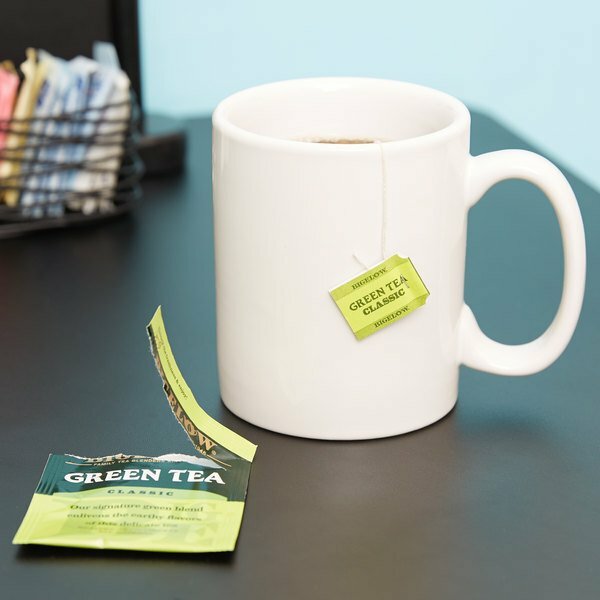 The Bigelow green tea is wonderful and is great to steep with fresh fruit for wonderful warm beverages. 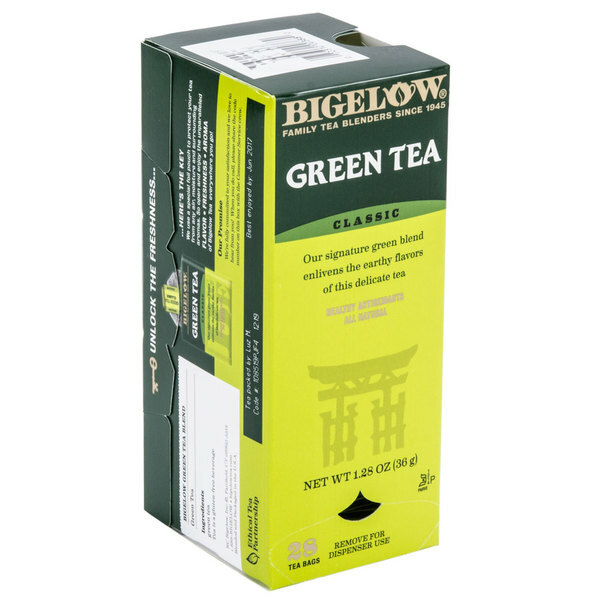 I love the antioxidants in green tea and the Bigelow brand is great. This twenty-eight pack of Bigelow Green Tea is exactly as described on the website and I have no complaints. The shelf life is great and I really appreciate the individually wrapped tea bags. I like to add a little lemon to any hot tea and with this tea it was a great compliment. I also like that the taste is not too overwhelming and I would order again.